English and Japanese books available for purchase and signing. In the early morning of August 6th, 1945, an eight year old girl played in the schoolyard with her classmates. Suddenly there was a flash of light followed by a tremendous blast. In an instant her life had changed forever. This is her story of survival and renewal. 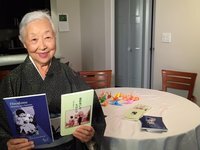 She hopes that her life and her story will enable people to reflect on the terror that war and nuclear weapons pose to present and future generations. NNMCC . Last modified Oct 11 2016 11:46 a.m.